my take: This is a great adventure and great memoir. Really, by the end, I felt like I'd hiked a long time. I almost couldn't believe at the beginning that she could actually do it ... when I read about her pack I thought, "NO! Go back! Don't do it!" Okay, okay, okay, I admit I'd never heard of the Pacific Crest Trail before reading this. I have heard of the Appalachian trail and this is it's sister trail on the west coast - only not as well known and not as well equipped in terms of hiker accommodations. It really is WILD. And so is the author. And she can write. 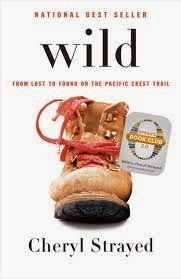 The subtitle is "From Lost to Found on the Pacific Crest Trail" and she's fairly free with her lost-ness in terms of relationships, drug use, and all manner of other human folly. And she's fairly inspiring.